Today’s scripture passage talks about becoming fools. Some became fools through their rebellious ways. Some became fools. Because they became fools, they suffered affliction, they even lost the appetite, and they were drawn near the gates of death. Because they became fools they suffer so much. The life is just full of suffering, continuous, repetitive suffering, struggle and hardship. Life is supposed to be enjoyed. Life supposed to be good, but because they have become fools, they don’t even enjoy life. They just survive. They just persevere through life rather than really enjoying the fullness of life because they have become fools. And I wonder why people become fools. I think these people are not stupid. I think they’re intelligent people, smart people. These are Jewish people. I think they are, have a high intelligence, and then why they have become fools and suffer so much. So meditating on this, I realized that becoming fool has nothing to do with your intelligence or the kind of intelligence or the level of education. We can be fools while we are being very smart. So that kind of intelligence does not really help us living a life. Being a fool is not lack of intellectual ability. I think there’s different kinds of intelligence. There’s intelligence that makes your life happy, enjoyable, and a good and all that stuff. But there’s intelligence that has nothing to do with a that just performance, doing well in job or whatever, a technical stuff, but there’s also intelligence that makes the whole life good and a happy and meaningful and all that. There are different intelligences. Sometimes we call it a wisdom. Being wise in that kind of intelligence is a combination of a ethical quality, intellectual ability, and even spiritual quality. That wisdom kind of intelligence consists of all of these three. But being smart is different from that. We see many smart people, I see many smart people around me but not many wise ones. It is that kind of intelligence that gives us. It gives our life good. So I wonder why? What makes smart people fools? What makes smart people fools? What blinds their eyes not to see what they’re supposed to see. I meditate on it and this word came up to me. That is greed. Greed. Greed makes a smart person a fool. Greed blinds our eyes not to be able to see what you’re supposed to see. When greed works in people, even though they may be very smart, they will become fools. The result is very bad. When greed is taken away from your eyes, only then you can see. But when is the greed taken off from your eyes? Only when you suffer. When you suffer so much and you tell yourself, I was so stupid, I was so fool. Only then the greed is taken off from your eyes and you see yourself. Greed makes people really fool. I believe that the smartest person in the world is Jesus Christ. He was the smartest person. When I read his writing and the wisdom and all that stuff, he was the smartest person. Deep inside of us, he was able to see through, but there’s one thing that he didn’t have. The smartest man in the did not have one thing. You know what? That one thing is? Strange, isn’t it? We think they are foolish people, but they think that the cross is foolishness, but the smartest person in the world, Jesus chose the way of the cross. I believe that he chose the way of the cross because he was smart because he was smart. He chose the way of the cross and I wonder why did he choose the cross? Why did he choose the cross? The smartest man in the world chose the cross. Why? 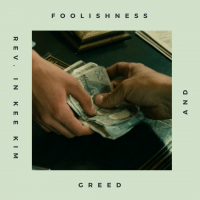 When all the smart people say the cross is foolishness and I realized that Jesus knew that the only way to experience God’s power is to let go of greed. That’s only way you can experience God’s power. If you don’t let go of greed, you cannot experience God’s power. God’s power can be only experience when you let go of greed. I thank God for that. What if God gave the God’s power to the greedy people? What the world would that be? But somehow God hid his power to the people who are greedy. The power of Resurrection, is hidden in the cross. Only through the cross we can experience the power of the resurrection. People who live with greed will never experienced God’s power. Rather they all become victims and slaves of their own greed and the result is destruction. The result is destruction. They think they are so smart they can take care of their lives, but at the end that is the end is destruction. On one side of the coin you see greed, but on the flip side of the coin, what you see is fear and insecurity. You have fear to see your own emptiness, your own bankruptcy within yourself. There’s nothing inside you. This fear you replace with greed having more, keeping more, being better than others. There’s a fear that what if my kids fall behind? What if I’m not loved and liked by others? What if I don’t make it? What if I don’t have enough? All this fear, they fill it with greed, so behind the greed, I see fear, worries, mistrust of oneself, anxiety about life comparison and so on. Greed will never give us true satisfaction. Greet by nature is insatiable. We’ll never understand the truth that if you lose it, you’ll find it. If you’ll find it, you’ll lose it. That’s the life truth that Jesus taught us. You try to gain it, you will lose it, but if you let go, you’ll find it. That truth of life, they’ll never understand what it is and they’ll never be content. In other words, still never be happy. Living with greed, we can never be happy. It doesn’t matter how much money you have, how big your house is, how great your car is. It doesn’t matter what it is, but you will never be happy. As long as you live on greed, you replace the happiness with all these things I call that I call this stupid. St. Paul’s life was very different from the life of greed. This is what he said, “not that I’m referring to being in need for. I’ve learned to be content. He learned to be content with whatever I have. I know what it is to have little and I know what it is to have plenty in any and all circumstances. I have learned the secret of being well fed or of going hungry, of having plenty and of being in need.” I called that smart. I call that happy life. He’s happy and he’s so big that circumstances don’t determine his happiness, he’s so satisfied. He’s so content. Doesn’t matter whether he has a lot or not. I call that real smart. Greed will lead us into dissatisfaction, complaints and corruption ultimately. There’s a lot of whatever is going on in Korea right now, not only North America, all the big guys are just. They are taken into prison. There are smart people. They are smart to get to the top of the society and yet greed swallowed them up. The end is destruction. The Psalms warns us today, becoming fools, we suffer affliction, lose appetite, and draw near the gate of death. My friends, living with greed is not fun. It’s not fun. It’s very difficult. It is never fulfilling. There is always dissatisfaction. Always complaining. From the mouth of the people with greed. All we hear is “I wish.” We don’t hear, “Thank you.” From their mouth, we don’t hear. “Thank you.” All we hear is: “I wish.” I wish better house. I wish better car. I wish more money. I wish more promotion. Always. I wish. Doesn’t matter where they are. They will die with I wish. Let us not feed our greed. Culture that feeds on greed is not a good culture. I don’t think we live in a such a good culture. Capitalism is not really the best thing for humanity. All the commercials they just create more cravings, more greed, so the kind of world that we live in, the kind of culture we are in a really good culture. We have to be aware of that. We have to be smart enough to see that it’s not a good culture. Letters in a feed on greed. Let us discipline our ourselves of letting go of our greed. Learn to let go of you greed. Let us be satisfied with small things that we already have and if we enjoy. Our children. Our good home. Good weather. Good people around you. Good community. It doesn’t cost that much money. They are there. Just beautiful as they are. With thanksgiving let us enjoy our lives and live the best we can ever have. Live the best life we can ever have. As we let go of our greed, somehow we’ve regained the appetite. That can be the problem for me. Too much appetite. Too much food. Too much eat. But as you let go of greed, appetite comes back not only appetite of food but of life. We’ll find new energy that comes from within us. If we live our life with fear before now, we can live with love. Don’t be awaken after you lose everything. Now be awakened and change lifestyle. You know, once you let go of greed, you know what happens. Greed turns into vision and dream. Wonderful. Greed is for myself, but the vision and dreams are for others and you start having this vision and dream for living for others. We may be busier but we’ll experience the joy and satisfaction we never experienced before. St Paul and Jesus, I mean talking a little bit, busy life. They live a busy life probably busier than any of you. They live a busy life and yet they were filled with satisfaction and joy and peace. The other day in, New York Times. This hedgefund trader. He wrote an article, he said he got $3.5 million as a bonus and then he was complaining that he didn’t get enough and then he wrote it. “This is crazy. I’m addicted. This is not good.” So he wrote his article repenting about his own situation. That’s not a good life. I mean $3.5 million bonus. You complain about that? Then that’s real foolishness. Greed is not good. 1987 movie Wall Street, the Gekko, that guy, “greed is good.” Greed is what moves us, and then he gives us a new civilization. All that stuff. BS. Greed is not good. Greed makes us blind, takes away the energy and oppresses us, but once we let go of our greed, new life will begin. We will see the brighter side of life. I guarantee that. Future will look promising. We’ll be able to see clearly the purpose of life and meaning of everything comes alive. Life comes alive. Greed is like dirty poison. It doesn’t kill you right away, but it slowly kills you. It comes in and slowly permeates through all throughout all existence and we’ve just become greedy people and unhappy people. It always lies. It always gives false promise that I’ll make your life happy. No, it will never make our life happy; is lie. Let us be wise by letting go of our greed and finding the true beauty of life. That’s what smart people do. Be Smart People. You have intelligence, but be smart people, really smart people. Only when you let go of your greed, then, only then, we’ll be smarter. Let us sing together.